Posted in General Health & Wellness on October 1, 2013. Last modified on January 31, 2018. Read disclaimer. Standing desks have been getting a lot of press lately, as a way to keep us more alert and, perhaps, lessen our risk of developing obesity and heart disease. That's because, according to some health experts, our bodies were not designed to be sitting all day. (In fact, sitting more than even 4 hours per day may compromise our health.) And while merely standing for hours on end is not as advantageous as moving about, for many of us who work at desks, it's a move in the right direction. Unfortunately, the cost of standing desks varies from $500 to over $2,000 depending on appearance, durability and options. And, while you can find plenty of DIY standing desk plans online, I wasn't crazy about the way they looked... plus DIY projects tend to really try my patience. So, below are photos of the compromise I ended up with. And I love it. 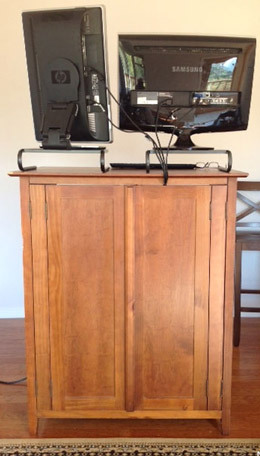 The TV cabinet (with the back panel removed) cost $20 from the Goodwill. The adjustable tray table (intended for someone who eats in bed or in a wheelchair is on loan from my father) holds the keyboard and mouse pad at the perfect height and distance from the monitors. 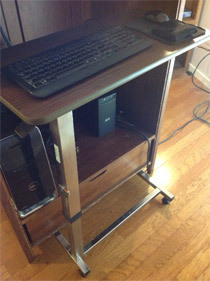 ∧ Back with cabinet panel removed and adjustable, overbed table for keyboard and mouse. If you have a standup desk opinion or experience you care to share, please post it in the comment section below.